Aligning our organization around a common structure, being able to drive accountability, speak the same language, and measure results were the fundamental principles behind implementing the new planning framework. Ensuring the execution of these new strategies was extremely important. The CHRISTUS healthcare system has a rich history as a Catholic healthcare ministry dating back to 1866. CHRISTUS Health was formed in 1999 after two large, historic Catholic health charities came together with a unique mission in the modern health care market: to take better care of people. Strategic planning is something in which CHRISTUS invests heavily. The strategy management team works as a liaison between CHRISTUS’s 10 ministries and the health system’s headquarters. Even after implementing the balanced scorecard methodology to standardize the planning framework, they still needed help managing strategy execution, tracking, and accountability. CHRISTUS adopted a tool that met their needs initially, but eventually determined they required a more flexible and more robust reporting system. The tool was difficult to navigate, so users were resistant to entering data into the system. Tina’s team then spent hours combing through disparate data sources to find the updates they needed, and still spent hours compiling manual reports. The process was time-consuming and inefficient. When CHRISTUS decided to evaluate alternative solution providers, there were two main factors they were looking for: user-friendliness and finding a system that could support the level of detailed analytics and reporting needed to truly hold people accountable. 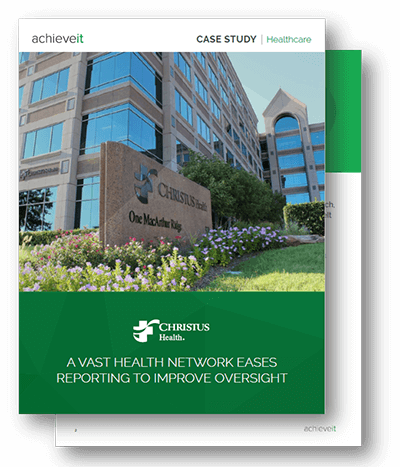 AchieveIt gave the strategy team at CHRISTUS the ability to efficiently report on strategy execution performance, collaborate across groups, and streamline business processes. CHRISTUS currently uses AchieveIt to track three main types of plans. Each ministry uses AchieveIt to track their portions of the organization’s strategic plan, aligned to their three-year directional objectives, initiatives, and measures. They also use AchieveIt to track their business development and operational plans. Learn how this hospital system implemented AchieveIt to increase user buy-in, decrease time spent reporting, and gained better visibility.